NB: We DESPERATELY need money for this unfunded megashow extravaganza, please watch our filmic plea, and consider donating a tax free donation to our crowdfunder! Written by disabled actor and writer Mat Fraser and directed by legendary feminist performer Julie Atlas Muz, Jack & The Beanstalk brings tap-dancing animals, puppets, pie fights, pop music, cross-dressing characters and the glitteriest of sets to the Lower East Side. 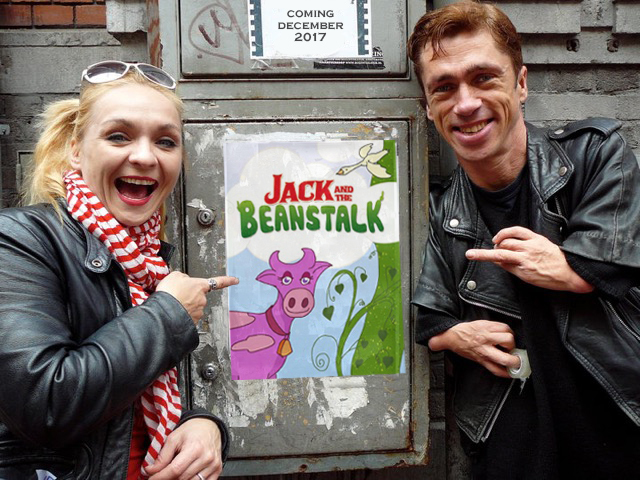 Returning to Abrons Arts Center after their critically acclaimed show Beauty and the Beast, Fraser and Muz are thrilled to be making their first all-ages event. 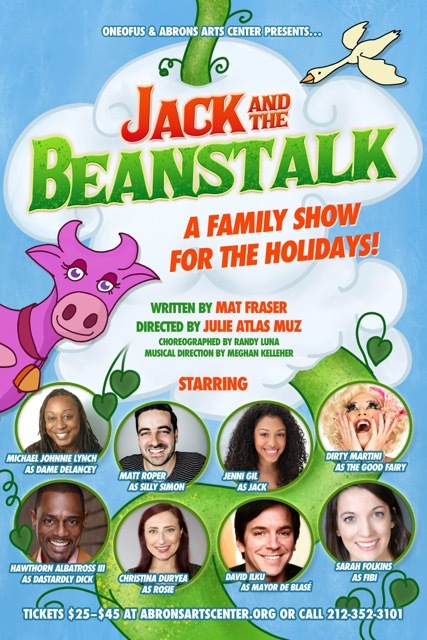 Performances of Jack & The Beanstalk will take place December 6–23 (see schedule above) at Abrons Arts Center, located at 466 Grant Street in Manhattan. Critics are welcome as of December 7 for an opening on Sunday, December 10 at 2pm. Tickets, priced at $25–$45, can be purchased here or by calling 212-352-3101. 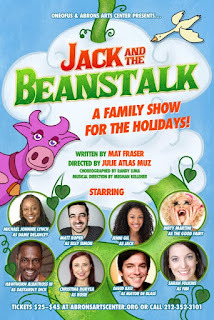 The cast of Jack & The Beanstalk, a mix of veteran and up-and-coming performers, includes Dirty Martini, Hawthorn Albatross III, Michael Johnnie Lynch, Matt Roper, Jenni Gil, David Ilku, Christina Duryea, Sarah Folkins, Ekaterina Sknarina, Jonathan Rodriguez, Poison Ivory, Allison Jane, Mikey Giordano, Lute Breuer, Rachael Wickham Shane and Kate Brehm, as well as a chorus of six children: Belle Breuer, Annabel Cole, Oliver Medlin, Dylan Cox, Briseis Mendez, and Nate Maxwell. Mat Fraser is best known for his role as Paul the Illustrated Seal in American Horror Story: Freak Show, and is a legendary sideshow artist who's worked in Coney Island's sideshow since 2000. He is a seasoned stage actor, having recently played the title role in Richard III in the UK, and look out for him in Peter Farrelly’s new TV comedy this fall, Loudermilk. Fraser is also a well-known drummer (he played with Coldplay in the 2012 Paralympics ceremony) and is a keen disability advocate. Julie Atlas Muz, one of the most acclaimed, legendary and prolific conceptual performers in New York, is a multi-laureate: a Whitney Biennial Artist, Lambent Fellow, a Franklin Furnace Artist to name a few. Deemed “Royalty of Burlesque” by The New York Times, winning both Miss Exotic World and Miss Coney Island 2006, Julie has appeared on the large and small screens, including the Cannes-Award-winning film, Tournée. We are outsiders, with inclusivity at the heart of what we do. Traversing the world as radical artists looking for alternative ways to be inside, the main thrust of our work is to highlight, question and poke fun at the absurdity of normality, using a loving cup of artistic agitation. We accept you, one of us. ONEOFUS is Julie Atlas Muz and Mat Fraser. We live just down the road and are integrated members of the Abrons Arts Center Community. Each year the Abrons offers over 250 performances, 12 gallery exhibitions and 30 residencies for performing and studio artists, and 100 different classes in dance, music, theater, and visual art. The Abrons also provides New York City public schools with teaching artists, introducing more than 3,000 students to the arts. For more information: www.abronsartscenter.org.